It's been quite a last few weeks for Matt Payamps of Saint Anthony's High School. Within the past month, the senior star, who seems to be able to compete well at almost any distance, turned in the No. 11 all-time performance at 1,000 meters, winning in 2 minutes, 25.09 seconds at The Virginia Showcase in Lynchburg, Virginia. 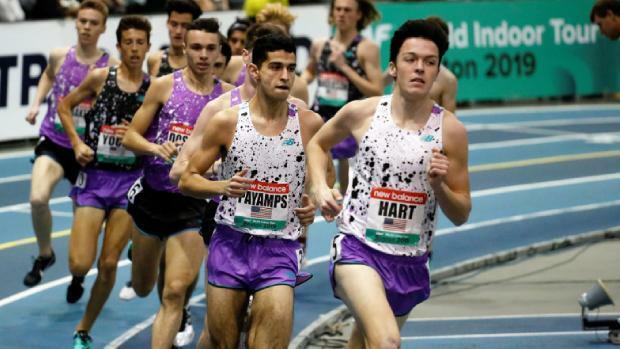 He followed that up with a 4:12.39 victory in the mile at the New Balance Grand Prix in Boston, and two weekends ago, he ho-hummed his way to wins at the NSCHSAA championship meet. This past Saturday, at the CHSAA Intersectional championship meet at Ocean Breeze in Staten Island, he was named the meet's Outstanding Athlete after winning the 600m in 1:20.45, and later taking the 1600m in 4:19.77. Payamps, seemingly always smiling, said of his 600m performance, "It was a tough race. I actually wanted to go under 1:20, but my legs felt tired on the first lap. But I started to get into it later, and came out with the win, so I wasn't too disappointed." The 1600m was "for the team," and Payamps is foremost a team man. "We've never had a runner with the range that Matt has," St. Anthony's coach Tim Dearie said. "And he's a tremendous young man, maybe the best person I've ever coached. He's the type of senior who will talk and give encouragement to the lowliest freshman on the team. You don't see that too often." 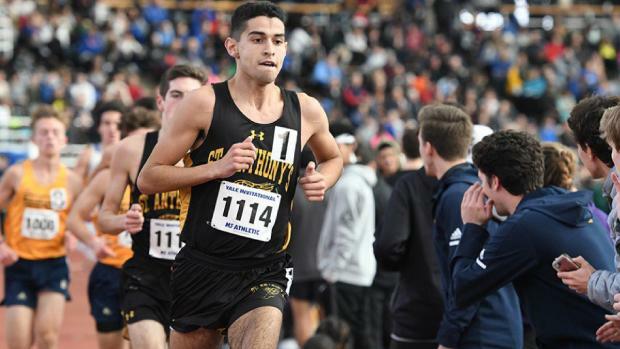 The St. Anthony's tradition of cross country and track and field excellence goes back decades, and Payamps is the latest in a long line of stars to wear the black and gold singlet. The Crooke brothers, Olympian John Gregorek, a legendary coach in Don Buckley, and modern-day stars such as Patrick Farmer and last year's ace, Mason Gatewood, are among the many notables. Now Payamps is adding to the rich tradition and carving his own niche among the pantheon of St. Anthony's heroes. There was some initial speculation concerning training and overall performance after the departure of Gatewood, but Payamps said "There was a little transition, but Brendan Dearie (the coach's son), Matt Reda, and I push each other in practice." The Friars had a lot on their minds at Saturday's meet. "It's been a crushing, hectic time," Dearie said of "my assistant coach and best friend" Bob Higgins, who ran the 400m leg on the championship distance medley at the Penn Relays in 1978. Higgins was recently found to have a brain tumor and is now in hospice care. There was a team meting prior to the Intersectional championship meet, with assistant coach Oliver St. Aude quietly giving the team additional motivation. The message was simple -- "Do your best -- do it for coach Bob, and for yourselves." Payamps took the message to heart. "A lot of us had coach Higgins' name on our spikes," he said. "I had 'Higs' on mine." Despite the inspiration, St. Anthony's fell to Iona Preparatory by 0.5 points, 27.5 to 27. "Some things didn't go our way during the meet," he said, "and it was tough to see the way the meet was unfolding at the end," but added that, "it will give us additional motivation for outdoors." So what's ahead for the senior star? In 10 days, he will compete in the USA Track and Field Indoor Senior Men's National Championships. His 2:25.09 in the 1K qualified at Ocean Breeze qualified him. "It's a nice chance to run very fast," Dearie said, adding, "I think 2:23 is in his wheelhouse -- Why not give him a shot?" Then it's off to the New York State Championships, where he will probably run the 600m and 1K. "Whatever he (Dearie) wants me to do, I'll do," Payamps said. "I trust the coach to do what's best for me." Outdoors is still a way off, but there's a DMR in late April at the Penn Relays, which both Payamps and Dearie are already thinking about. 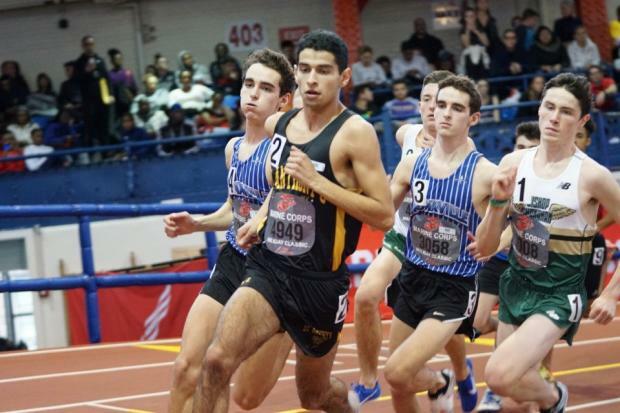 Last year Payamps ran 4:08.34 for his anchor 1600m leg at Penn, and St. Anthony's ran under 10 minutes (9:59.87), but the Friars came up short to Hopewell Valley, and specifically Sean Dolan's 4:07.57, which his squad the win in 9:57.77. Also on Dearie's mind is the 4:05.4 school record in the mile, last set by Gregorek, New York State record of 4:02.7, which was set by Matt Centrowitz Sr in 1973. "We're going to try to find a race where he can run fast," Dearie said, "but we're not going to chase the thing the whole season." With personal bests of 1:52.51 in the 800m, 4:08.32 in the mile and 8:56.06 in the 3200m, plus excellent cross country credentials and a solid academic resume, the colleges came calling. Next year, he'll take his talents to Georgetown University, where he'll join a talented stable of middle-distance runners. Payamps said Hoyas men's distance coach Brandon Bonsey "laid out a four-year plan that appealed to me." That, plus the academic reputation of Georgetown and it's location as a cultural center, also seemed like a good fit. So Payamps might have a few good years ahead of him, too.